Dimensions 1.25 by 6.50 by 6 in. Amazon.com description: Product Description: Our intuition on how the world works could well be wrong. We are surprised when new competitors burst onto the scene, when businesses protected by large and deep moats find their defenses easily breached, or when vast new markets are conjured from nothing. Trend lines resemble sawtooth mountain ridges. 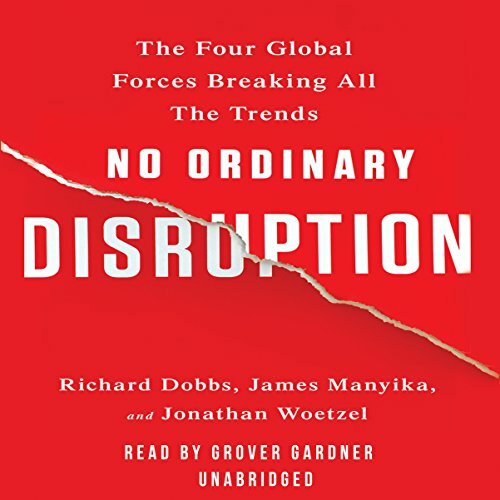 The world not only feels different, the data tells us it is different.Based on years of research by the directors of the McKinsey Global Institute, No Ordinary Disruption: The Four Global Forces Breaking All the Trends is a timely and important analysis of how we need to reset our intuition as a result of four forces colliding and transforming the global economy: the rise of emerging markets, the accelerating impact of technology on the natural forces of market competition, an aging world population, and accelerating flows of trade, capital, and people.Our intuitions formed during a uniquely benign period for the world economy--often termed the Great Moderation. Asset prices were rising, the cost of capital was falling, labor and resources were abundant, and generation after generation was growing up more prosperous than their parents. But the Great Moderation is gone; the cost of capital may rise, the price of everything from grain to steel may become more volatile, the world's labor force could shrink, and individuals, particularly those with low job skills, are at risk of growing up poorer than their parents.What sets No Ordinary Disruption apart is depth of analysis combined with lively writing informed by surprising, memorable insights that enable us to quickly grasp the disruptive forces at work. For evidence of the shift to emerging markets, consider the startling fact that by 2025 a single regional city in China--Tianjin--will have a GDP equal to that of Sweden. In the decades ahead, half of the world's economic growth will come from 440 cities, including Kumasi in Ghana and Santa Carina in Brazil--cities that most executives today would be hard-pressed to locate on a map.What we are now seeing is no ordinary disruption but the new facts of business life--facts that require executives and leaders at all levels to reset their operating assumptions and management intuition.